A mineral premix produced to increase the digestibility of Phytin-bound Phosphorus. Formulated to be added at 50 pounds per ton in grower and finisher feeds. 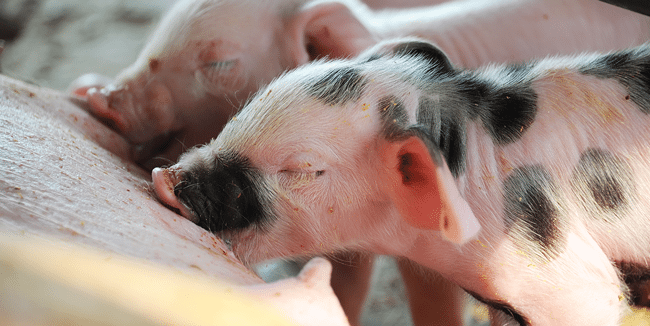 Formulated for the Extra Prolific Nutrition needed by high producing sows and is designed to influence the factors that contribute to increasing pigs weaned per sow lifetime. A 20% complete feed formulated to increase feed efficiency and drive weight gain. Contains Witmer’s Enviro Lean G-F vitamin and trace mineral blend with Phyten-bound phosphorus and is fortified with Choline and toxin binders. Feed free choice. 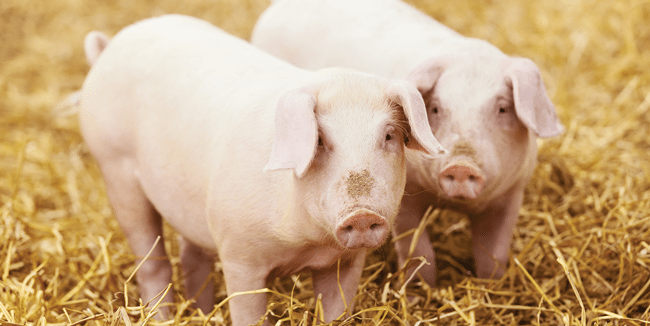 A complete feed designed for growing and finishing pigs. Formulated from a base of corn and soybean meal and fortified with calcium and phosphorous to optimize skeletal growth. Contains all vitamins and trace minerals needed as well as toxin binders. A complete feed formulated from a base of corn and soybean meal suited for weight maintenance in the mature hog. Contains Witmer’s Enviro Lean G-F vitamin. A 19% complete pelleted feed designed for pigs weighing 40-90 lbs. to promote maximum lean muscle deposition. Medicated or non-medicated available. Feed 3-5 lbs. per day. An 18% complete finishing pelleted feed designed to increase rib shape and overall cover in show pigs weighing 100-275 lbs. A 16% complete feed well suited for young growing pigs. Formulated with Enviro Lean G-F, Lysine HCL, trace minerals and choline to promote optimal health during gestation. Contains toxin binders and yeast for the reduction of gastroenteritis. An 18% protein, 5.5% fat pelleted feed formulated for growing show pigs to promote rapid lean muscle growth and skeletal correctness. Flavored to enhance palatability to increase appetite and drive consumption. 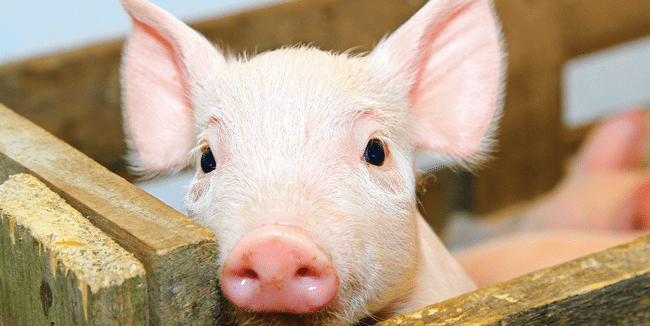 To be fed as a sole ration to growing/finishing show pigs until desired weight is met. *One unit of phytase activity (FYT) is defined as the quantity of enzyme which liberates 1 micromol of inorganic phosphorus per minute. Environmental factors such as feed pH, moisture and processing methods such as pelleting and extrusion may affect enzyme activity. Calcium carbonate, monocalcium phosphate, dicalcium phosphate, salt, L-lysine, potassium chloride, ferrous sulfate, zinc sulfate, zinc oxide, manganese sulfate, copper sulfate, manganous oxide, ethylenediamine dihydriodide, calcium iodate, pork fat (preserved with BHA), vitamin A acetate, vitamin D supplement, vitamin E supplement, vitamin B12 supplement, riboflavin, niacin, calcium pantothenate, menadione dimethylpyrimidinol bisulfite (source of vitamin K activity), dried Aspergillus oryzae fermentation product (phytase), sodium selenite. Feed the above mix as the sole ration to growing and finishing swine. A clean, fresh source of drinking water is also necessary. This product has been formulated specifically for swine and is not intended for other species. grain products, plant protein products, calcium carbonate, montmorillonite clay, diatomaceous earth, monocalcium phosphate, dicalcium phosphate, L-lysine, potassium chloride, zinc oxide, dried Schizosaccharomyces pome fermentation product (pytase), ferrous sulfate, copper sulfate, manganese sulfate, manganous oxide, vitamin E supplement, niacin supplement, vitamin A supplement, vitamin D supplement, zinc sulfate, sodium selenite, calcium pantothenate, vitamin B12 supplement, riboflavin supplement, folic acid, menadione sodium bisulfite complex, ethylenediamine dihydriodide, salt, hydrolyzed yeast, yeast extract, yeast culture, coconut oil, FD&C Blue #1. Grain products, plant protein products, tallow, montmorillonite clay, diatomaceous earth, calcium carbonate, monocalcium phosphate, dicalcium phosphate, salt, L-lysine, potassium chloride, zinc oxide, dried Schizosaccharomyces pome fermentation product (pytase), ferrous sulfate, copper sulfate, manganese sulfate, manganous oxide, vitamin E supplement, niacin supplement, vitamin A supplement, vitamin D supplement, zinc sulfate, sodium selenite, calcium pantothenate, vitamin B12 supplement, riboflavin supplement, folic acid, menadione sodium bisulfite complex, ethylenediamine dihydriodide. Grain products, plant protein products, montmorillonite clay, diatomaceous earth, calcium carbonate, monocalcium phosphate, dicalcium phosphate, L-lysine, potassium chloride, zinc oxide, dried Schizosaccharomyces pome fermentation product (pytase), ferrous sulfate, copper sulfate, manganese sulfate, manganous oxide, vitamin E supplement, niacin supplement, vitamin A supplement, vitamin D supplement, zinc sulfate, sodium selenite, calcium pantothenate, vitamin B12 supplement, riboflavin supplement, folic acid, menadione sodium bisulfite complex, ethylenediamine dihydriodide, salt, hydrolyzed yeast, yeast extract, yeast culture, coconut oil, FD&C Blue #1. Grain products, plant protein products, tallow, monocalcium phosphate, dicalcium phosphate, montmorillonite clay, diatomaceous earth, calcium carbonate, L-lysine, potassium chloride, zinc oxide, dried Schizosaccharomyces pome fermentation product (pytase), ferrous sulfate, copper sulfate, manganese sulfate, manganous oxide, vitamin E supplement, niacin supplement, vitamin A supplement, vitamin D supplement, zinc sulfate, sodium selenite, calcium pantothenate, vitamin B12 supplement, riboflavin supplement, folic acid, menadione sodium bisulfite complex, ethylenediamine dihydriodide, salt, yeast culture. grain products, plant protein products, processed grain by-products, processed grain products, monocalcium phosphate, dicalcium phosphate, animal protein products, calcium carbonate, salt, potassium chloride, L-lysine, zinc amino acid complex, manganese amino acid complex, copper amino acid complex, iron amino acid complex, Dl-methionine, choline chloride, chromium propionate, L-threonine, artificial flavors, zinc oxide, vermiculite, hydrated sodium calcium alumino silicate, propionic acid, amorphous silicon dioxide, ammonium hydroxide, ferrous sulfate, copper chloride, copper sulfate, mineral oil, yucca schidigera extract, manganese sulfate, vitamin A supplement, manganous oxide, vitamin D supplement, vitamin E supplement, biotin supplement, vitamin B supplement, brewers dried yeast, organic selenium, dried yeast fermentation solubles, riboflavin supplement, niacin, zinc sulfate, thiamine mononitrate, calcium pantothenate, folic acid, pyridoxine hydrochloride, l-trytophan, ethylenediamine dihydriodide, vitamin K supplement, Whey Permeate, tallow, sodium carboxymethyl-cellulose, corn distillers dried grains with solubles, hydrolyzed yeast, yeast extract, yeast culture, coconut oil, FD&C Blue #1. For control of swine dysentery associated with Brachyspira (formerly Serpulina or Treponema)hyodysenteriae susceptible to tiamulin. Processed grain by-products, grain products, plant protein products, tallow, calcium carbonate, monocalcium phosphate, dicalcium phosphate, L-lysine, potassium chloride, zinc oxide, dried Schizosaccharomyces pome fermentation product (pytase), ferrous sulfate, copper sulfate, manganese sulfate, manganous oxide, vitamin E supplement, niacin supplement, vitamin A supplement, vitamin D supplement, zinc sulfate, sodium selenite, calcium pantothenate, vitamin B12 supplement, riboflavin supplement, folic acid, menadione sodium bisulfite complex, ethylenediamine dihydriodide, salt, roughage products. Feed as sole ration to swine a feed containing 35g/ton of Tiamulin Hydrogen Fumerate. Withdraw 2 days before slaughter. This feed contains added copper, do not feed to sheep or other copper sensitive animals. Processed grain by-products, grain products, plant protein products, tallow, monocalcium phosphate, dicalcium phosphate, calcium carbonate, montmorillonite clay, diatomaceous earth, L-lysine, potassium chloride, zinc oxide, dried Schizosaccharomyces pome fermentation product (pytase), ferrous sulfate, copper sulfate, manganese sulfate, manganous oxide, vitamin E supplement, niacin supplement, vitamin A supplement, vitamin D supplement, zinc sulfate, sodium selenite, calcium pantothenate, vitamin B12 supplement, riboflavin supplement, folic acid, menadione sodium bisulfite complex, ethylenediamine dihydriodide, salt, yeast culture, hydrolyzed yeast, yeast extract, coconut oil, FD&C Blue #1. Processed grain by-products, grain products, plant protein products, processed grain products, monocalcium phosphate, dicalcium phosphate, animal protein products, calcium carbonate, salt, potassium chloride, L-lysine, zinc amino acid complex, manganese amino acid complex, copper amino acid complex, iron amino acid complex, Dl-methionine, choline chloride, chromium propionate, L-threonine, artificial flavors, zinc oxide, vermiculite, hydrated sodium calcium alumino silicate, propionic acid, amorphous silicon dioxide, ammonium hydroxide, ferrous sulfate, copper chloride, copper sulfate, mineral oil, yucca schidigera extract, manganese sulfate, vitamin A supplement, manganous oxide, vitamin D supplement, vitamin E supplement, biotin supplement, vitamin B supplement, brewers dried yeast, organic selenium, dried yeast fermentation solubles, riboflavin supplement, niacin, zinc sulfate, thiamine mononitrate, calcium pantothenate, folic acid, pyridoxine hydrochloride, l-trytophan, ethylenediamine dihydriodide, vitamin K supplement, tallow, montmorillonite clay, diatomaceous earth, hydrolyzed yeast, yeast extract, yeast culture, coconut oil, FD&C Blue #1.